Mahindra Duro’s website is at best average attempt at showcasing the same cut & dry details that you find on every auto category website. 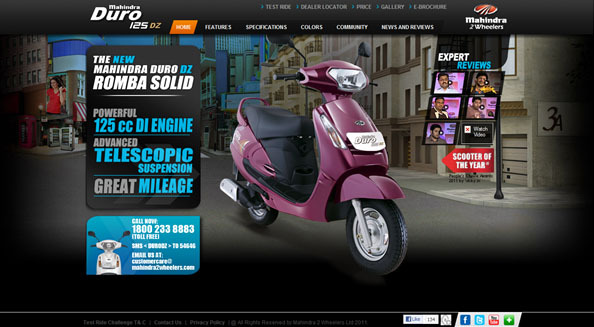 The site follows the predictable template of providing product features, specifications, colours, news & reviews etc. The sections are laid out in multiple scrolls on the same page with videos on every section which play out in theatre mode. The Facebook Brand Page mirrors the same content that’s available on the site, via a wall post a day. This one is an underused asset as far as I can see it. The digital campaign for the two-wheeler did have a lot of potential especially as it attempts to reach a young female TG and has a popular celeb endorser but the execution seems a tad uninspired and fails to excite or engage. And we are not even discussing the television commercial here. Not so Romba after all. A far cry from the Mahindra Rise execution.